With their signature teal branding and names like Sufganiyot, District Doughnut is not your typical doughnut shop—nor does it strive to be. When you step foot into any of its three locations across the city (four when the Nationals are in season), it is easy to see what they’re about: bringing joy and happiness through the classic American food of the doughnut. Nothing more, nothing less. 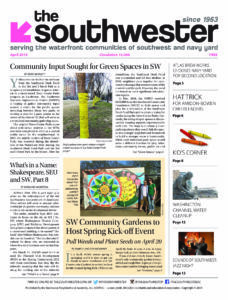 As co-founder and CEO Greg Manna notes, in the mid-2010s, this city was deep in the cupcake craze, but outside of large national chains, there was no doughnut shop in the District. In 2012, Manna was approached by his childhood friend Juan Pablo Segura about starting a doughnut business in the District (they both grew up in the area). Manna agreed, and was soon introduced to Executive Pastry Chef Christine Schafer. Fast forward to the fall of 2014, District Doughnuts opened that teal door on Barracks Row and it’s been a wild dough-filled ride ever since. After Barracks Row came Georgetown—larger than the Barracks Row shop, and featuring a different twist that fits that neighborhood so well: an art gallery. Shortly thereafter came a spot at Nationals Park, where fans can enjoy America’s favorite pastime with another layer of Americana nostalgia. 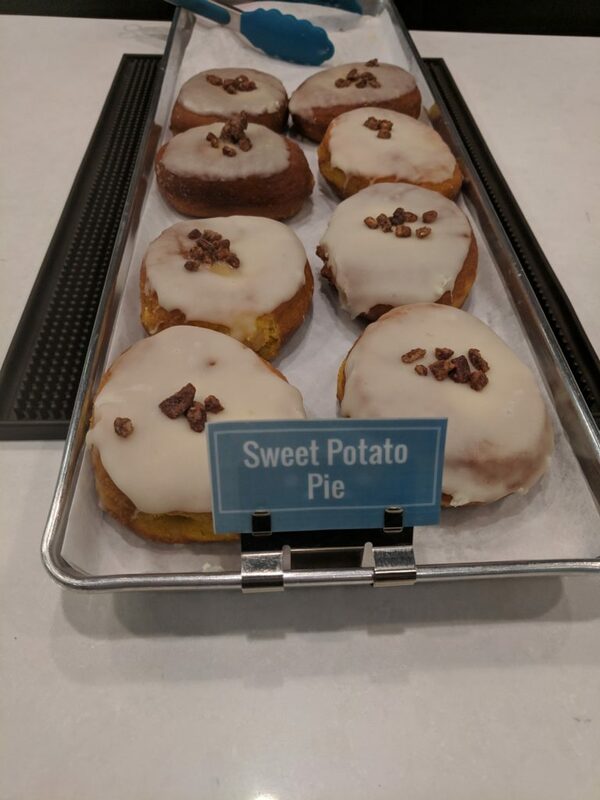 This past fall, District Doughnut opened at The Wharf, in what is quite arguably the coolest doughnut shop in the country, and maybe even the world. 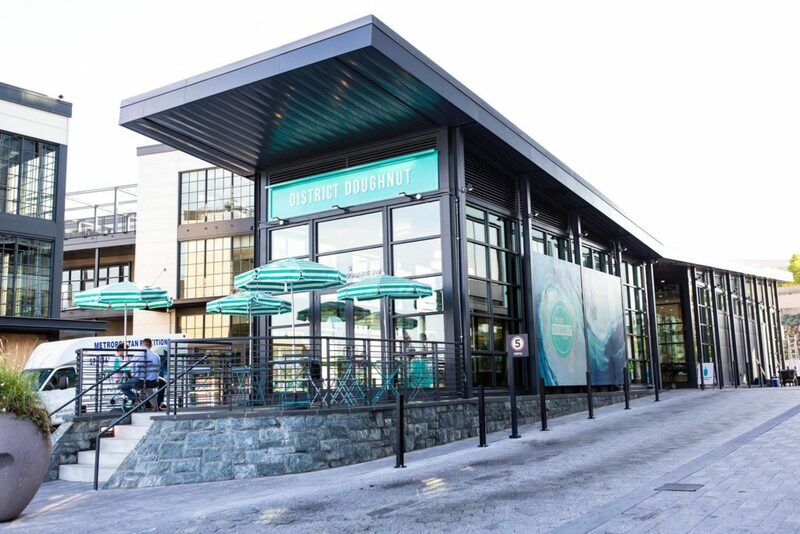 With its outdoor patio overlooking the Washington Channel marked by umbrellas in white and that signature teal, and an all-glass enclosure with sleek lines inside, The Wharf location is indeed different than the others, but fits right in with its other surroundings along the water. As Manna said in our interview, “a jewel box of a building.” With seating inside forthcoming, visitors currently belly-up to the continuous ledge that follows glass, making for perfect people watching while noshing on one of the 12 available doughnuts. This location is so small, only 900-square feet, that the team is unable to make the doughnuts onsite. 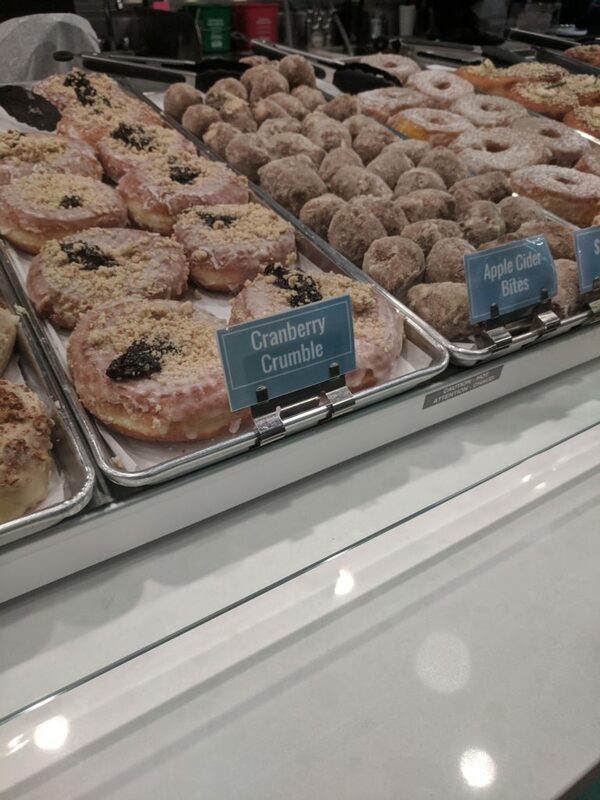 Instead, they are driven over multiple times a day from the Barracks Row location to keep up with the demand and ensure visitors to The Wharf location have only the freshest of doughnuts. So what makes District Doughnut so different than anything else? It all starts at the beginning: the yeast dough at the heart of the District Doughnut is made 24-hours before it is put in the fryer. Schafer, who is a Cordon-Bleu trained pastry chef, spent months figuring out the perfect recipe, which can only be classified as a classic French pastry dough. Manna was also quick to point out that District Doughnut does not use a custard filling—instead any filled doughnut is made with a pastry cream. With a bite into a menu staple and one of the bestselling over the last four years, the Brown Butter (vanilla bean dough, cinnamon sugar and a brown butter drizzle), it is easy to see why District Doughnut is a cut above the rest. The doughnut is soft, fluffy with a bit of a tear to it, encouraging the consumer to savor every last bite and indulge in the simple happiness of a doughnut. Another menu staple was born from leftover dough of the brown sugar—the District Doughnut cinnamon roll (vanilla bean dough, cinnamon sugar and a vanilla bean glaze). Once only featured on the weekends, it has recently been added to the menu full time, and judging by the reaction on social media (and one of the brand’s favorite hashtags #happinessfound), the decision was a strong one. The menu rotates by the season with only 12 doughnuts available, always keeping costumers guessing what original design will be featured next. Past examples of Chef Christine’s unique additions include a sweet potato doughnut (it tastes like Thanksgiving in a doughnut and has real pumpkin mixed into the dough), a cannoli doughnut (made with the signature vanilla bean dough, chocolate chip ricotta filling, and sprinkled with doughnut sugar and cocoa powder), the Fluffernutter (the signature yeast dough, with a marshmallow pastry cream and peanut butter glaze), and a savory flavor with the Everything Cream Cheese (whipped chive onion cream cheese on the inside and everything bagel seasoning on the top). No matter what flavor is chosen, however, customers will not be disappointed.